​I got an early Birthday present today from Blue Angel Publishing! "Whispers of Healing" is now in the warehouse and available to purchase. 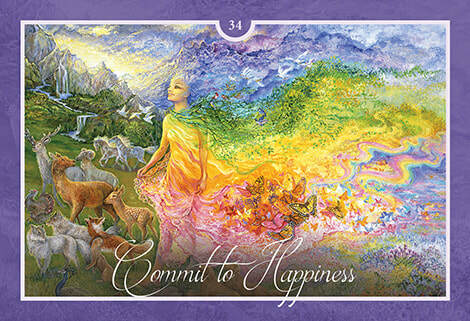 I chose card 34 from the deck to share a message as we get ready to start the weekend. True happiness comes from within. It is hard to be happy when everything in your life seems to be falling apart. When you are facing a crisis, you may look for alternative ways to have more energy or to be soothed. Pay attention to what you do to comfort yourself. Do you binge eat, drink excessive amounts of coffee or go on shopping sprees? Oddly, these activities are counterproductive to achieving happiness. You may be comforted in the moment but in the long run, you are setting yourself back. It is difficult to feel happy when you are tense, overtired, depressed or unable to exercise due to circumstances. You may feel lost, give up hope or as if you can’t imagine ever feeling well enough to achieve your dreams. Your life circumstances may have changed, but it is important to find something new you can become completely absorbed in. Appreciate the good moments, good days and the blessings in your life. Stop for a minute and reflect on the glimpses of happiness life is constantly giving you. Achieving happiness can mean working hard at being happy. Look at your situation realistically, face the reality of your capabilities and limitations, and know you can be happy. Take simple steps every day that make you feel in control and happy. It is up to you to claim your happiness. A rainbow-coloured goddess walks powerfully forward. There is sheer joy on her face as she moves toward a lush green meadow. A multitude of butterflies follows the goddess as if they are pushing her along. There are numerous energetic nudges, encouraging you, pushing you toward happiness. Animals walk with the goddess, completely comfortable in her energy. Which animal did you notice first? There may be more messages for you from this animal. The rainbow energy flowing from the goddess represents your chakras. Ensure your basic needs are met and your chakras are balanced. When you are working on happiness try to balance yourself as much as possible. Excited to announce a third deck by Angela Hartfield & Josephine Wall: Whispers of Healing Oracle Cards! Whether you wish to heal a broken heart, resolve a work challenge or discover ways to fine-tune your beliefs and attitudes,this deck is designed to journey by your side as a source of support, guidance and insight. Angela Hartfield is a certified psychic medium, intuitive reader/healer, Reiki Master, Certified Raindrop Practitioner (CRP) and Professional Spiritual Teacher. She has authored 4 decks of oracle cards and a journal. Her newest oracle cards, created with Josephine Wall: "Whispers of Healing" will release in Australia in December 2017.